The Brazilian lawmaker, Eduardo Bolsonaro, exclaimed that a one-way exemption for U.S. visitors is appropriate and that illegal Brazilian immigrants are "our shame." 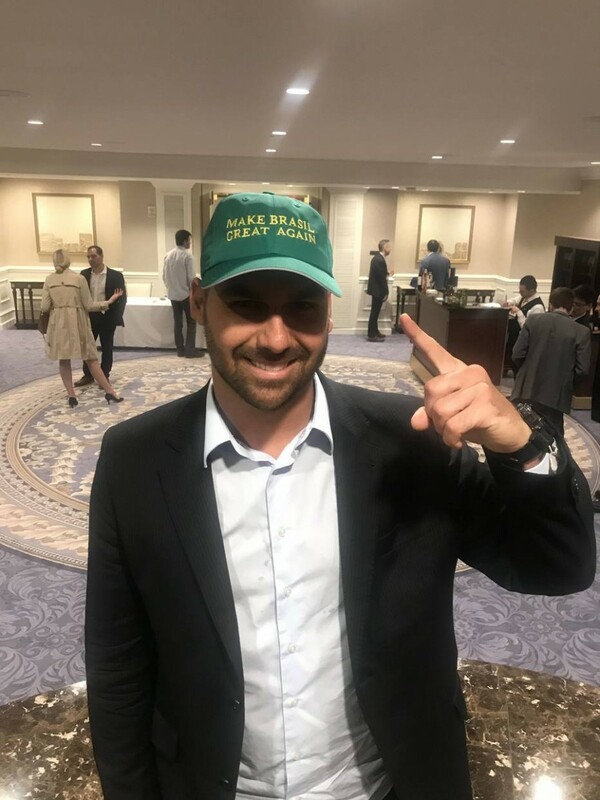 RIO DE JANEIRO, BRAZIL – This weekend, Brazilian federal deputy (lower house representative) Eduardo Bolsonaro told reporters he supported a visa waiver for U.S. visitors going to Brazil that did not include a reciprocal visa waiver for Brazilian visitors going to the U.S.
Brazilian federal deputy Eduardo Bolsonaro, sporting his Trump-inspired, “Make Brasil Great Again” cap, told reporters he was ashamed of Brazilian illegal immigrants, photo internet reproduction. Bolsonaro cited the potential for Brazilians to try to immigrate illegally as the reason he thought a unilateral visa exemption was appropriate. “How many Americans will come to live illegally in Brazil to take advantage of this exemption, to enter here as a tourist and live illegally?” asked Deputy Bolsonaro, who was recently elected chairman of the lower house’s Foreign Affairs and Defense Committee. The federal lawmaker made the statement while speaking to reporters in Washington, D.C. where his father, Brazil President Jair Bolsonaro arrived on Sunday, March 17th, for his much-anticipated sit down with U.S. president, Donald Trump on Tuesday, March 19th. When several reporters asked Deputy Bolsonaro to elaborate on the issue of illegal Brazilian immigration, Bolsonaro said that he considered it a nation-wide dilemma. Just last month, in addition to his duties as deputy and chairman of the Foreign Affairs and Defense Committee, Bolsonaro was appointed head of the Brazilian faction of The Movement, a network of right-wing political parties and politicians started by Steve Bannon. This would be wonderful for me, as a US citizen. Maybe eventually Brazil could get a visa waiver status; this would be a first step.